Occasionally, when I’m talking to friends in the UK about the fun I have with my French riding club, I get a slightly wide-eyed reaction. Well, the simple answer is that I don’t imagine they’ve given it too much thought, as it’s something that’s culturally accepted in France, although it does seem to be getting rarer. When I lived in France in the early 90s, you could still see some dedicated horsemeat butchers in various towns, and it was quite common to see ‘cheval’ on a menu. Now, it’s rare to see it listed on a menu, and although our local supermarket does stock it, it’s limited to a single option among a vast range of other meats. New EU labelling regulations also mean that meat in supermarkets is far more clearly labelled than it used to be, so there’s not much danger of the unsuspecting tourist buying it by accident. The horses used for consumption also seem to be completely separate from the riding breeds. Some locals in my area (the Midi Pyrenees) have taken to breeding horses for meat again in an attempt to preserve rare breeds, much as British beef farmers did with Shorthorn cattle. Like many British sheep, pigs or cows, if the animals weren’t being bred for meat, they wouldn’t be bred at all, and the heritage breeds would die out. The meat horses look different to riding horses, as they tend to have very broad backs and exceptionally well-muscled rumps, and are in general much heavier – again, like beef cattle compared to dairy cattle. 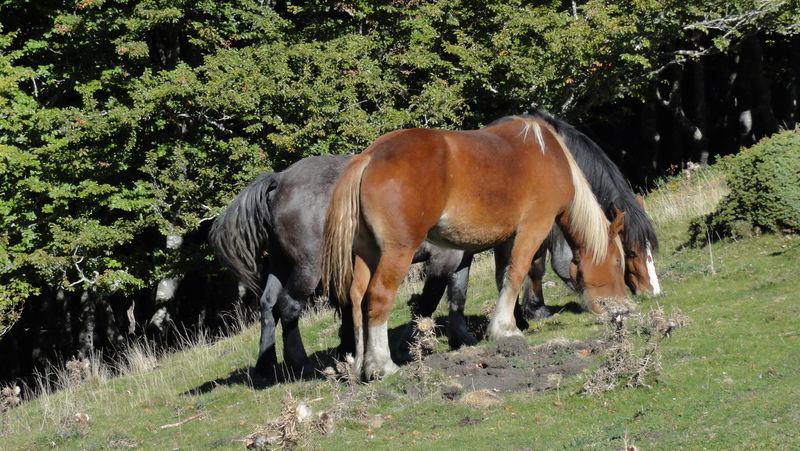 It’s common to come across a few ‘meat horses’ grazing on the mountains or in fields, and they’re often in company with herds of sheep or cattle. All the French horse riders I know are as dedicated to the health and happiness of their riding horses as we are in the UK, and I guess get round the horsemeat ‘problem’ by thinking of the meat horses as a different animal. Horses for courses, as we might say. ← Drivers vs. horses – who comes out on top? i have actually eaten horse meat (unknowingly) and it tastes somewhere between beef and venison. I haven’t eaten it since… i just felt bad about it. I know lots of people who’ve eaten it accidentally, years ago, and they all said the same thing – the taste was fine, but they didn’t feel comfortable with it. Fortunately it’s a lot harder to eat horse by accident these days! Everything is clearly labelled, and it just seems to have fallen out of favour a bit. If you haven’t been brought up with it, I think it just doesn’t sit comfortably.